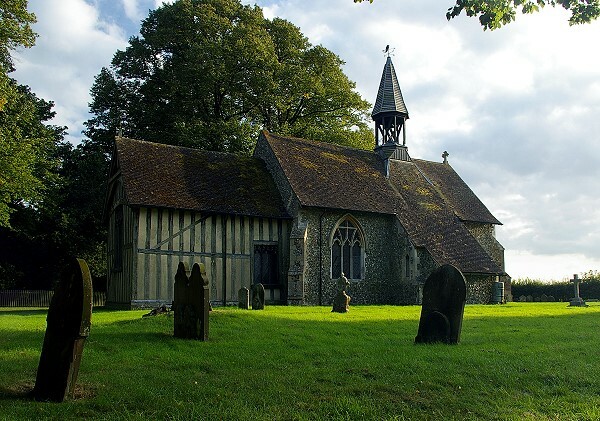 Crowfield is a small and scattered community and the church of All Saints is hidden in trees but surrounded by open farmland about a mile away. There has been a place of worship on this site for 600 years. It seems the original nave was built during the 14th century and the chancel was added in the 15th century. During the 17th and 18th centuries much of the medieval beauty was lost, In 1862 an extensive restoration took place. Until the 1920's this building was a chapelry of Coddenham and was known as Crowfield Chapel. The 15th century chancel which is of a timber framed construction is unique in Suffolk churches and extremely rare in churches of eastern England. A weather vane and crow was added in 2004. Many thanks to 'RH' for his kindness in sending the information. I waited over half an hour for the little patch of grass to be lit up by the sun.